When Vicky Silverthorn left school she had no idea what she wanted to do, so took a job as a barmaid in a golf club. A few years later she landed a job as Lily Allen’s PA, and today is opening up a chain of successful You need a… businesses. 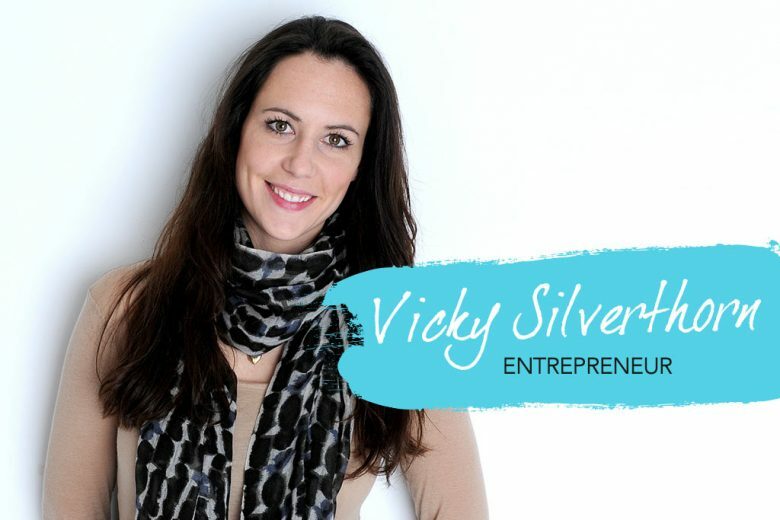 Vicky shares the story of her success with us, and reveals why she believes that niceness goes a long way in business. I was one of those people who didn’t have a clue what I wanted to do at school or college. I just followed the crowd and was a rather lost soul. It felt like everyone else seemed to know what they wanted to do except me. AT the age of 18 I trained as a nanny, then I worked behind the bar of a golf course – still with no idea what I wanted to do with my life. So I decided to give myself one year off worrying about where my life was going and what I was going to do, and just enjoy my job – one of the most enjoyable I ever had. I worked with wonderful people and my confidence grew enormously. How did you become a PA? Towards the end of the year, one of the members of the golf club asked me if I would join his sports management company as their PA. I had no idea of what the job was, but liked the idea of a challenge so I accepted. Initially the job was office-based, and the company looked after five big-name golfers on the European Tour. Over time, the company grew and we had over 25 players. I began a two year stint of travelling with my clients around the world and seeing so many countries. I loved the job, but after four years I felt I had ticked all the boxes in that role, so I moved to London and got a job as a PA to a football agent. This role felt much more corporate. It was office-based without much client-facing interaction. How did you become Lily Allen’s PA?! I missed meeting people and the variety of travel, so decided to look for a new challenge. This time my goal was to work for one person, learn a new industry and travel. I applied for the job of Lily Allen’s PA and after a great interview I was offered the job. I was over the moon. Working for Lily was one of the most amazing experiences of my life. The travel was extensive and fantastic. So many countries in such a short space of time. I loved it. I also realised how important people skills were. Throughout school we’re told continually that we need to have great English and maths skills, but once you’re out in the working world, it’s as much about how you get on with people. My people skills (as well as organisation) were a big part of my job. I finally felt that I had found something that suited me. I made Lily’s life as easy as possible for her, and ensured that everything ran smoothly. I loved the responsibility and was driven by pride. Lily was a fantastic boss and I wanted to be the best PA I could possibly be. Why did you leave Lily? I was so grateful that Lily had given me the opportunity, but after a while I felt that I had grown as much as I could in the job, and wanted to do something different. When Lily started her family I decided to move on. It seemed like the perfect time. Lily was very supportive. She even let me use a fantastic quote from Grazia Magazine, which really helped me on my way. What inspired you to start You need a Vicky? I didn’t know what I was going to do next. Initially I considered setting up a freelance PA company, but I felt like I’d PA’d myself out! My brain was ready for something different. I was practical and hands on, and loved physical organisation, so decided to set up a business using these strengths and passions. I knew there was market for it but I also knew I was taking a risk – I had heard of companies doing similar things, but felt I could do this well. It was something I loved doing. Organisation isn’t just important for your admin – it’s also important for the spaces that you walk past every day. Your spare room, wardrobe, cupboard… if they’re cluttered they drag you down and wear you out. I started it at the perfect time, it’s becoming more and more popular and increasingly accepted. Today I am usually booked up around six weeks in advance. I’ve never worked so hard in my life, but I’m willing to do anything to it make work. The first thing I needed was a name. I chose a terrible one with a cheesy ring to it on purpose so people would remember it! It also had great relevance to a very important character I had worked with. Initially I gave away free days to people. I didn’t have a plan, but instinctively I thought if I give away a free day to this person and prove myself, they’ll tell one other person, and four months down the line 50 people may know about it. So I gave away around 20 free days in the first year. And it worked. Even today, four years on I’ll get calls from people who were recommended to me by someone I gave a free day to at the start. I stand by my choices. How have you found running your own business? I love every day – it never feels like work! On Sundays I get a buzz from knowing what’s ahead the next week. I feel very lucky but I know how much hard work I have put into my business. I want to inspire others thinking of taking that leap. I had no business experience when I started You Need A Vicky. I didn’t even write a business plan – my brain doesn’t work that way. I felt it was more important for me to identify a goal in my own head and be clear about what I wanted from a business. Working hard was my only option. What personal qualities do you think are important in business? You have to have a willingness to learn and prove yourself – you can’t start a business with a sense of entitlement, you need to work hard to get somewhere. It’s okay for ideas to adapt too, it’s a natural thing. It would be very naïve to think that everything is going to go exactly according to plan. So it’s important to be very versatile in your thinking. I also think niceness is highly underrated in business. I hope I’ve proved that you don’t need to be nasty to get somewhere. I’m at the point in my business now where I’m not interested in working with or for anyone that causes me stress or is just not very nice. Where would you like to be in five years time? I hope to be running between six and eight You Need A… businesses in five years. I’m opening two early this year. Everyone who co-runs them with me will be fantastically inspirational people who wanted a change of career and stood out from the crowd. Do you have a PA? I do, yes! My admin skills have also gone to pot since I stopped working for Lily! I knew things were growing at a rate I was really excited about, and I needed someone to help me. It felt very strange at first to hand over part of the control, but now I couldn’t cope without her! Shelly is my rock! What advice would you give to someone who is thinking about a change of career or starting their own business? I would say to anyone who is not in a job or a career they love that they don’t have to stay there! You can set yourself a goal and reach it. You need to have belief – belief in yourself and that it can happen. You also need to dig deep into your personal resources. It’s also important to be nice as well as polite and courteous to everyone. I am happy being the type of business woman I am. I have set my levels and they aren’t through the roof. They are just so. Don’t worry if something doesn’t go according to plan – wrong choices shouldn’t always be seen as bad choices. You always gain something – even if you’re just learning valuable lessons from an element of failure. With belief and self-confidence, it’s only you who can make things happen. The world owes you nothing, as they say. Write down your goals- if you’re not clear on what you want to be or where you want to go, you’ll be less driven to get there. Oh, and be true to yourself and try hard! And finally, who needs a Vicky? 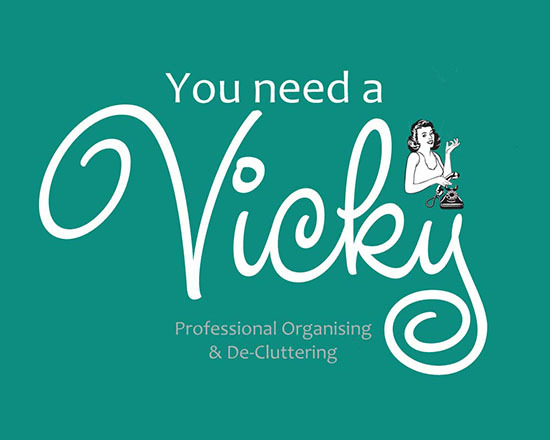 Anyone who needs help organising and decluttering their life! I can help you streamline your life and get in back on track. People ask me for help with packing and unpacking when moving, having a baby, starting a job or business, going back to work, starting a new health regime… even just clearing out and organising their kitchen, or a springtime sort-out. I believe most changes in life should start with a declutter and organise. It can help to clear your head as well as your physical space, and help you to enjoy life more, with the weight of the clutter gone. Your home feels like a sanctuary again and you can enjoy living in it. It’s a wonderful feeling and something I often need in my own life! Vicky and stylist-to-the-stars Ellie Stidolph have also just launched You Need A Stylist complimenting perfecting the wardrobe organisational services she provides.